Spider 'Sumo' Fighting in Kumamoto and Kainan. Do you know spider 'sumo' fighting? In Japan, many years ago, Japanese children enjoyed spider 'sumo' fighting. However, the destruction of nature took it away from Japanese children. Volunteers are now trying to succeed the traditional of Spider Sumo or 'Kumo Gassen ', as it called in Japan, and preserving it as an important cultural heritage. The most famous Kumo Gassen is the one held in June each year in Kajiki town in Kagoshima prefecture. The local people say that the Kumo Gassen started more than 400 years ago in Kajiki. Two other spider sumo fighting competitions were held in July 2009 in Kumamoto and Kainan. This is a report on the 13th annual spider sumo fighting competition in Kumamoto City, Kyushu Island and the 10th annual spider sumo fighting competition in Kainan City, Wakayama prefecture, Honshu Island. These two games closely resemble each other in several ways. The Spider Sumo competitions in Kumamoto and Kainan are both modeled after that used in Kajiki. Of course, each of the fighting arachnids is 'Kogane-spider',or Argiope amoena. 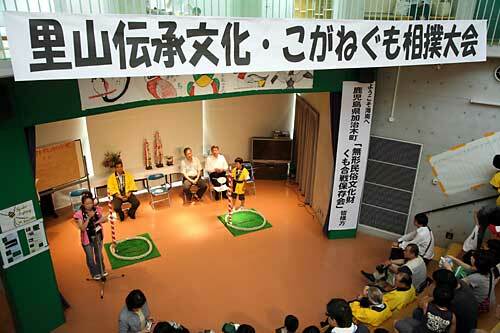 The 13th annual spider sumo fighting competition was held in Kumamto in Jul.19, 2009. 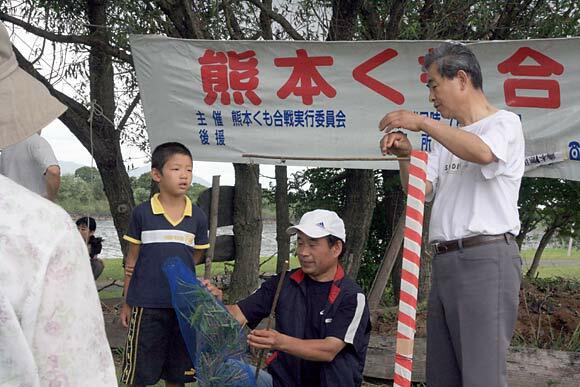 The 10th annual spider sumo fighting competition was held in Kainan in Jul.12. 2009, with the attendance of three guests from Kajiki. The banner reads that "The traditional cultural heritage of 'Satoyama'". If you would like more information on Satoyama, Click here.